This is a quick, go to dish when you want to eat healthy but have no time. It’s not as fast to make as a sandwich but it sure is a lot tastier. It takes about 20 to 25 minutes to make. 1. First step is preparation! Season your meat with the salt, pepper and garlic powder. Chop your onion and tomato. 2. 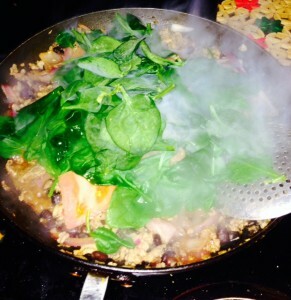 Set your skillet to medium high and mix all the ingredients together except for the spinach. Add the vinegar while it’s cooking. Make sure to toss the picadillo and ingredients until the turkey picadillo is a bit golden in color and the onions are caramelized. 3. Right before you take the picadillo off the skillet, place the spinach on top. 3. Serve with a healthy side of your choosing!